I pretty much already showed you this…but here’s some outdoor real life pictures. 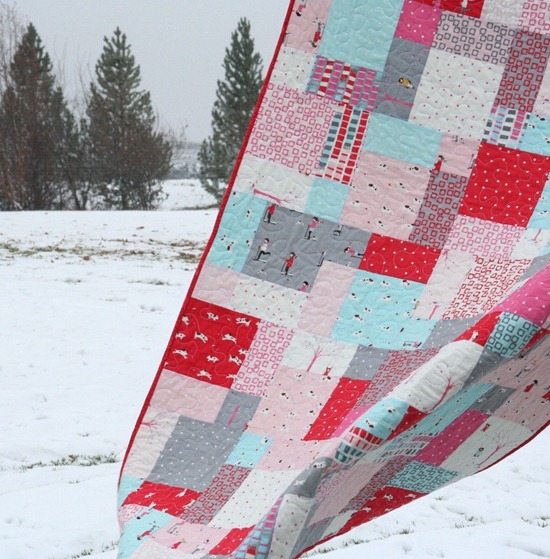 This quilt matches the snow outside…especially that scarf print. Its backed with one of my favorite aqua Target sheets and bound with a red Bliss print. This pattern is available in my shop. It is made with a layer cake and has the finished look of a disappearing 9 patch, but it is even easier…promise. This pattern is perfect for the large print fabrics you don’t want to cut up into little bits. Absolutely darling quilt. It is adorable and I'll absolutely…. 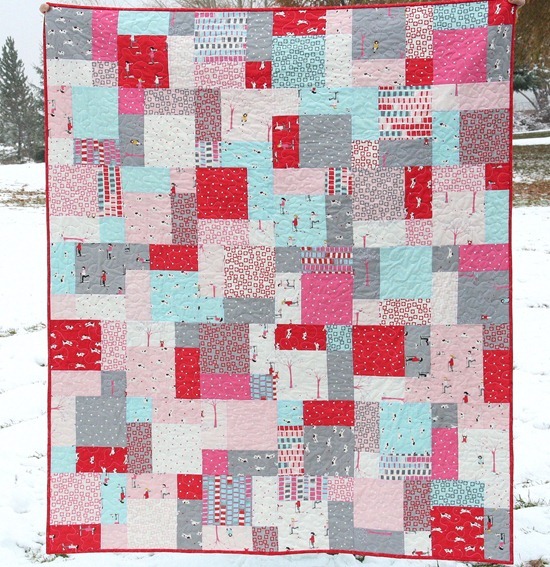 positively going to add to my fabric stash in April….. birthday present to me…..Sherbet Pips is too cute. I just hope I'll be able to cut into the fabric when I get it. Sometimes it is hard to make that first cut….don't you think???? Sigh—it is beautiful. Color me green! I love this fabric and you did it justice!!! Now if you only had a layer cake of Sherbet Pips in your shop I'd be all set! It's so cute and as long as the quilt didn't get any goose poop on it, the photo shoot was worth it, right? Lovely! It's nice to let the pints do the talking sometimes. that is just adorable and then some! I sure wish we didn't have to wait to long to get this fabric. It is awesome. So is the quilt. Yeah, sorry about the duck poop…. your duck poop comment made me smile! Thanks for the comic relief today! 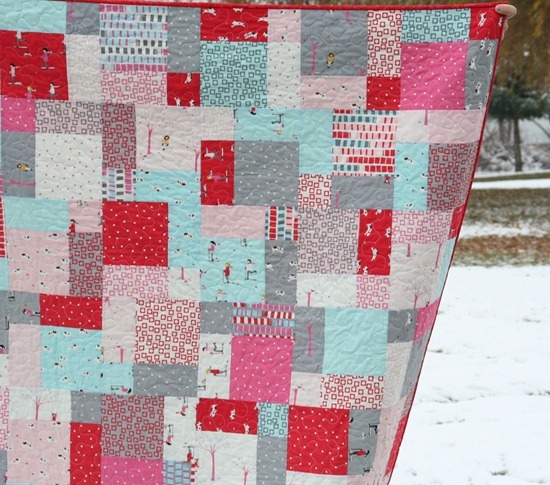 Great quilt too, I love red and aqua! It's such a perfect winter palette! Easier than a D9P? I didn't know it got easier! Oooh! So cute. Can't wait to get this fabric! LOVE it! I hope the poop wasn't from Canadian geese. We often get blamed up here! I do so love the Sherbet Pips! I wish I could do big stippling like you! I so want some of that fabric!!! I think this is my favorite quilt EVER. Seriously. I love it! Great job! I just adore that fabric!!! It turned out beautifully! And sorry for laughing about the duck poop — hate that!! You get the color combinations so beautifully! Oh I love this! The fabric is darling!!! And, sorry about the duck poop….lol ick! What a great looking quilt. I LOVE the colors and the fabric is just adorable too. I think this is one of my favorites. I love the winter prints. The skaters, the colors, I love it! Just love this quilt! Would look great on your bed too! You are my favorite blog! Love this pattern! Where can I get it? I really like this pattern and I’m especially looking for a pattern that doesn’t cut up beautiful fabric into really small pieces! This would be great as I have three layer cakes of gorgeous Christmas fabric that I want to make into a quilt for my son and his wife.